While the physically fit may consider shoveling snow as just another workout, it can be problematic for others. Many people associate back problems and sore muscles with shoveling the driveway and sidewalk, but there are other risks as well. For example, heart attack rates are elevated during the winter months and these heart attacks are often the result of shoveling snow. When it snows this winter, follow these safety tips to maintain your health and avoid injury. Avoid shoveling right after waking up in the morning. Slipped disc injuries are more likely to occur in the morning due to the build-up of fluid disc from lying down all night. Be sure to stay hydrated while you work and continue drinking water after you’re done shoveling snow for the day. Spend 5-10 minutes stretching before you head outdoors to shovel snow. This will help prevent sore muscles later. Wear gloves, hat, etc. to cover your extremities. Also, wear layers of clothing and shed the layers when necessary to prevent overheating. Wear sturdy boots with a rubber sole to prevent slipping and falling. Take frequent breaks while you work. If you become fatigued, put down the shovel and go inside to rest. When possible, avoid lifting a snow-filled shovel. Instead, it is safer to push the snow off your driveway and sidewalks. If you must lift the snow, be sure to face the direction you are lifting and twist as little as possible. 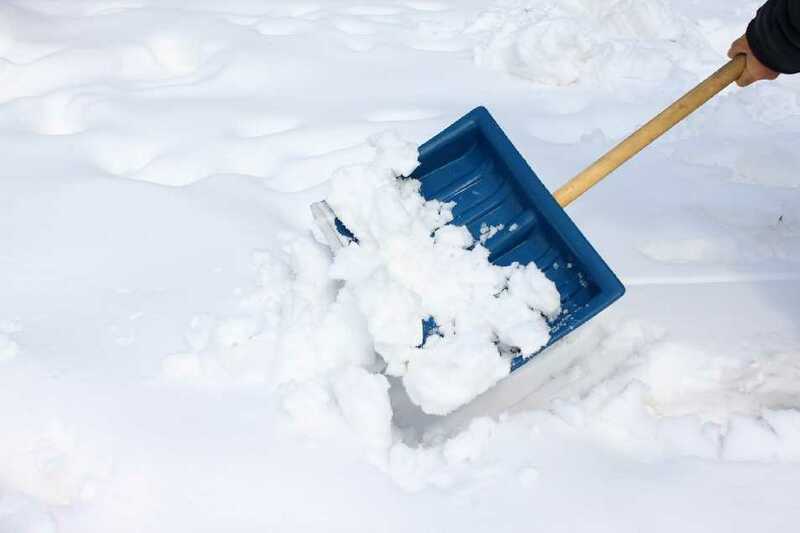 Spray or rub your shovel with lubricant such as cooking spray or WD40 to help prevent snow from sticking to the shovel. The lighter the load, the better for your body. Check with your doctor if you believe shoveling snow might present a health hazard, especially if you have a heart condition.